Erik Larson will appear at Kepler's Books on Monday, April 13 to discuss his latest novel, "Dead Wake." Erik Larson always manages to find the unexpected stories in history. Ever since his 1999 bestseller, "Isaac's Storm," an account of the Galveston Hurricane of 1900, Larson has crafted nonfiction sagas with all the suspense and narrative drive normally associated with fiction. In 2003's "The Devil in the White City," he wrote about a serial killer at the Chicago World's Fair. "Thunderstruck" (2006) found the connections between the birth of radio and the murder trial of Dr. Hawley Harvey Crippen. And with 2011's "In the Garden of Beasts," Larson chronicled an American family's tragic experiences as residents of Hitler's Berlin. Now, in "Dead Wake: The Last Crossing of the Lusitania," Larson addresses a tragedy many readers might think they know too well. The centennial of the disaster is May 17, and in its honor, Larson weaves a gripping tale of hubris, bad timing and unexpected courage. On Monday, April 13, Larson will discuss and sign "Dead Wake" at Kepler's Books in Menlo Park. Cunard's gigantic and luxurious Lusitania set sail from New York on May 1, 1915, bound for Liverpool, England, with a full roster of first-, second- and third-class passengers, including a record number of children and infants. The fastest civilian ship of its day, Lusitania seemed unstoppable, with no need for anyone to worry that Germany and England were at war or that Germany had posted warnings that travelers booking passage on English ships "do so at their own risk." Larson's narrative includes scenes aboard the Lusitania, with its irascible Captain William Thomas Turner and diverse assortment of passengers (whom he referred to as "bloody monkeys"), as well as descriptions of life aboard U-boat 20 under the leadership of Kapitänleutnant Walther Schwieger -- known for his focus on his missions and his compassion for his crew. The book's title comes from the maritime term for "the disturbance that lingers on the surface of the sea long after the passage of a vessel -- or a torpedo." Many people assume they know the story of the Lusitania, but often they are wrong about even the most basic facts. Reached by phone during a book tour stop in Kansas City, Larson said, "I think the biggest misconception is that the Lusitania was a World War I equivalent of Pearl Harbor. 'Boom! Ship sinks. We're in the war.'" Larson would ask friends and family how long they thought it was between the time the Lusitania was sunk and the U.S. entered World War I. The estimates ranged from two days to two months. "Guess what? It's two full years." One of Larson's first major research stops was the Hoover Institution Library at Stanford University. It was there he had the first inkling of the scope of the material available to him. "I realized that there was this tremendous trove of archival materials that, in my view, had not been used to maximum advantage," Larson said. "What I saw was a body of material of a richness that I had never encountered for any of my past books, all these wonderful elements for what suddenly occurred to me might be an exercise in nonfiction narrative suspense. It seemed to allow me an opportunity to put on my 'Hitchcock hat,' if you will, and construct a narrative that was three parts maritime thriller, one part informative, necessary history." Larson's research took him "pretty far afield," with so much time needed in Europe that he and his wife decided to base themselves in Paris for six months. Larson said he hates to fly and that traveling by train via the Chunnel made his intensive trips more comfortable as he visited the National Archives of the United Kingdom, Cambridge University and the University of Liverpool, home of the Cunard Archive. "Dead Wake" is filled with highly memorable characters and first-hand witnesses, from Boston bookseller Charles Lauriat, traveling across the Atlantic with irreplaceable editions by Dickens and Thackeray, to Theodate Pope, the first female architect licensed in Connecticut. Winston Churchill plays a significant clandestine role in the saga, and a short story by Sir Arthur Conan Doyle offers an early glimpse of a future where submarines are formidable nautical weapons. Larson also recounts episodes from the private life of the widowed President Woodrow Wilson. "His story was very tragic. In August of 1914 he loses his wife, just at about the time World War I blows up. Here he is facing this world crisis and he's alone and he's grieving. And then come 1915, he falls in love with this 40-something widow, Edith Galt." Larson found himself hooked by Wilson's letters to Galt. "These were incredibly passionate, with this outpouring of need and loneliness from a guy I had thought of as kind of stiff, prim and proper," he said. Also compelling is the contrast between the captains of the two vessels fated to meet in the North Atlantic. "Turner was a staunch sailor of the old school who was confronting something his training never prepared him for: a wholly novel situation," Larson said of the man who ended up being blamed for the disaster, despite the fact that an ultrasecret spy group, working under the British Admiralty, knew the ship was at risk. As for the captain of U-20, Larson at first imagined him to be a cold-blooded, stereotypical villain, perhaps with a scar and monocle. The truth proved more complicated. "Turns out Schwieger was a nice guy," Larson said. "Young, handsome. Humane, by all accounts. Well-loved by his crew. Well-liked throughout the Submarine Service. And yet here is someone who, at the press of a button, killed 1,200 people. How do you rationalize that?" To gain first-hand experience with transoceanic travel in preparation for writing "Dead Wake," Larson embarked on a Cunard voyage, one that took him through especially stormy waters. As he contemplated the coming weeks of air travel required for his book tour, he said of the cruise, "That was great. I will take the Queen Mary 2 in a Force 10 gale over a one-hour flight in a regional jet. It spoke to my Scandinavian soul, I guess." 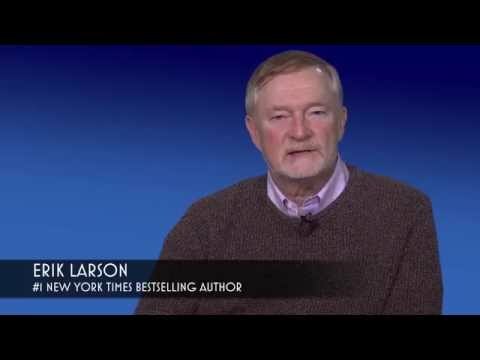 What: Erik Larson signs and discusses "Dead Wake"
When: Monday, April 13, 7:30 p.m.